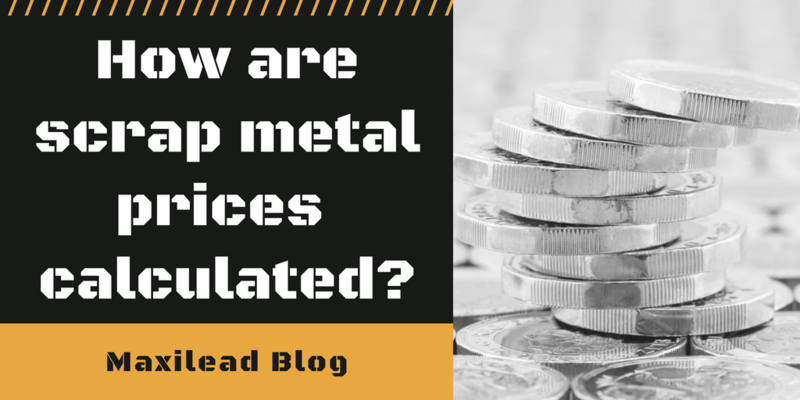 How are scrap metal prices calculated? Home > News > Uncategorized > How are scrap metal prices calculated? If you’re looking to sell your scrap metal then more often than not price is going to be a big factor in your decision making. Though recycling scrap metal brings many benefits that aren’t revenue based, getting a fair price for your goods is still vital. But, how can you be sure that you’re getting that honest rate? This is how scrap metal prices are worked out. If you’re not an expert in the business, then knowing when to trade in your metal for top prices can be tricky. The price of the material can vary depending on many circumstances but you still want to make sure that you’re getting the best rates possible. Knowing how scrap metal prices are worked out can give you a crucial insight into the industry so you can be certain that you’re getting the best deal. One of the big deciders in the price of your scrap metal is actually the type of material that you are trading in. To the average person, metal may just seem like metal – but did you know that there’s actually tons of different classifications for metals? All of which determine it’s end price at the trading point. The most common two types of metals are ferrous and non-ferrous, but these can be further sorted through their properties such as their density and tensile strength. Typically, copper and brass goods carry the most value in the scrap metal trade. Alloys such as gold and silver are often worth the most – but are not so commonly recycled. It may surprise you to know that a lot of items you have lying around your home unused are actually the most sought after in scrap metal yards. Construction waste also often carries a high sell-in value, so it’s well worth investigating what your scrap is worth. Another big determiner of price is the current market value of the material. At Maxilead, our competitive prices are designed to match and beat the industry rates. But, it’s worth noting that these figures can fluctuate often. With volatile commodities and stock markets, it’s a good idea to always lock in a quote as soon as possible. The latest scrap metal prices can often be found online, so you can easily compare rates and ensure that the deal in which you are being offered for your materials is both fair and just. It goes without saying, but it’s also important for your scrap metal to be of a good quality. Metals can usually still be recycled even if they are of a poor quality, but this can decrease their value as there’ll be a number of additional steps that need to be taken in order to standardise the material for recycling. But what constitutes ‘poor quality’? Broken household items that are no longer functional are a favourite for the scrap metal yard. The good news is that even though an item no longer has a practical use, this still doesn’t necessarily mean it’s in bad condition. The core elements are still there. Rusted metal is another topic of interest. If a metal has oxidised, does this reduce its sell-in value? Usually, the answer is no. Rusted metal can still be recycled and the rust is often easy to remove. Sometimes however, the damage can be extreme which could impede the reusable quality of the material. It’s worth checking whether this kind of damage to your scrap metal will affect its price. Similarly to above, the amount of work needed to bring your metal to ‘repurposing quality’ may affect its value and play a part in how your scrap metal prices are worked out. State of the art machinery is often required at every stage of metal repurposing. If less steps have to be taken before this end product is reached, this may possibly increase the value of the metal. It’s worth getting in touch with a metal recycling specialist to check this. Yards that are within close proximity to both ports and large cities are the ideal kind. This is why we think Manchester is a great location for us – it boasts a practical position with a wealth of opportunity. Location is important, especially for exports. Easier external transport links means fewer overheads than a yard situated in, well, the middle of nowhere. If a company has lower transportation costs and is based within a busier city, then they’re likely to offer better rates than those situated rurally who might not have such an active trade. If you’re weighing up your options, then it’s well worth considering a yard that is positioned in a great location – such as Manchester which exhibits excellent transports links and a sizeable population. Ensure that your scrap metal prices are always worked out with you in mind. Though the industry is competitive, there are specialists that will be able to offer you the best value for your goods. Contact Maxilead Metals today to uncover our competitive prices and outstanding services.